Our freezer has beef soup bones and T-Bone steaks left. It shows that we don’t like sharing our T-Bone steaks that much, they are too tasty. I’m counting down the days when our freezer will be restocked again. It is the middle of the week and the Cowboss felt like grilling. Can’t blame him, the weather has been so nice, not as hot, but warm enough to enjoy our summer evenings outside. He grilled our T-Bone steaks to perfection. I made “potato boats” as the Easton Clan calls them. They are really twice baked potatoes, but I go with the Easton tradition and call them potato boats. I also wanted to try a new side dish – puff pastry tart. Our greenhouse is producing tomatoes left and right and I wanted to use them up in a different way than just in a salad. I have recently made peach tarts and they were hit, so I thought, why not a savory tart. So, here goes the recipe for Tomato and Serrano Ham Tarts. Perfect addition to our tasty dinner. Defrost the dough – use instructions on the box. I did 4 tomato and 5 Serrano ham squares. Sprinkle each square with 1 tablespoon of shredded cheese. Top with sliced tomatoes or cut up ham. Put squares on a cookie sheet lined with parchment paper. Sprinkle the tomato squares with sea salt. What is the difference between “live”, “hanging” and “freezer” weight? We have been recently asked what is the difference between “live”, “hanging” and “freezer” beef weights? 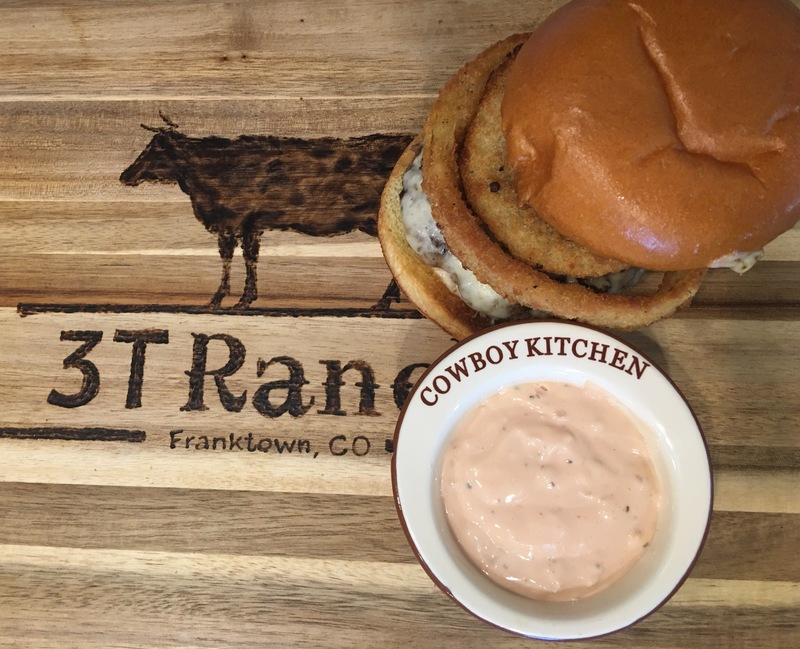 3T Ranch sells beef with our prices based on freezer weight. Why, do you ask? Here is some information to consider when ordering beef. When it comes to beef weights, there are 3 different ones of which customers should be aware. The first is “live” weight. This is what the animal weighs on the hoof alive. The live weight of our steers usually averages around 1,000 lbs. The next weight is “hanging” weight. This is the weight that the butcher charges their processing fee on and is based on a “dressed” animal. Dressed simply means the hide and all organs have been removed but all of the bones and other unusable parts are still included; and this gives the hanging weight of the animal. The hanging weight is usually about 60% of the live weight. So, a 1,000 lb animal would have a hanging weight of approxiamtely 600 lbs. The last weight is the “final” or “take-home” or “freezer” weight. This is the weight of the actual beef that each customer will bring home and gets to put in the freezer and then on the BBQ. It is only the packaged steaks, roasts, and ground beef. This weight is usually about 40% of the live weight, or 67% of the hanging weight. So for our 1,000lb live steer that had a 600lb hanging weight, it would have a 400lb “freezer” or “take home” weight. The difference between hanging weight and freezer weight is two parts: water weight lost during the 10-14 day period that the beef is aged, the rest comes from the bones and unusable parts that are cut out during the processing and packaging. We choose to sell our beef as “freezer” weight. This provides the customer with a total price that doesn’t change as well as the customer knows how much beef they actually get in the freezer. For a ¼ share, you get 100lbs of beef for $710, which is $7.10 per finished pound, the order is consistent every time. This allows the customer to plan ahead and there are no surprises. All fees from the processor are already included in the total price. Many ranches sell beef by “hanging” weight, in this method the customer is given an approximate total sales price and an approximate amount of beef (lb.) in the freezer. Each animal weighs a different amount and therefore the ranch or the processor can only estimate how much beef there will be after the processing, the “freezer weight”. The hanging weight includes all of the bones and extras before processing, it is not what you get to take home in the freezer. Each animal has a different yield (the ratio of freezer weight to hanging weight) so you’re not sure what the end price will be and how much you will get out of it. It is the easiest way for the ranchers and processors to charge, but we feel like it is not the most transparent method for the customer. Why not just charge for what you get to take home, so the price and quantity are known up front? It’s more like buying beef at the store, the price is marked on a given cut that has a given weight; you don’t have to guess how much the whole animal weighed at one time or what it’s yield was. Given our example above of the 1,000lb steer, our 100lb “freezer” weight ¼ share is $7.10 per pound. For comparison sakes that would be the same as a 150lb hanging weight ¼ share at $4.73 per pound (4.73 x 150lbs = $710 and would yield 100lbs). A quarter of beef at $4.73 per pound hanging weight is the same as $7.10 per pound freezer weight. Some also sell based on hanging weight plus processing. The cost of processing would then be added into the hanging weight cost for the final amount at pickup. Processing is usually about 70 to 80 cents per pound extra. Our pricing is always the final price, inclusive of all processing and packaging costs. We know it gets confusing trying to compare the different pricing methods our there, so we try to make it as straight forward as possible, your order will be the stated weight for the stated price. Even though our beef packages are based “freezer” weight we have added pricing on our website 3T Ranch Beef Price List that shows prices for both methods “freezer” and “hanging” weights. It’s a nice cool evening outside, the sun is not beating on us and the cowboys didn’t spend all day working outside. That means I got them to eat outside! This is a big deal at our house. The cowboys spend a lot of time outside fixing the fence, gathering cows or whatever needs to be done that day. They do it in all weather conditions, sunny, windy, hot, freezing, snowy, you name it. So, the last thing they want to do is to eat dinner outside. But, not tonight! On evenings like tonight, we like to fire up the grill and cook some cheeseburgers. Guacamole and bacon are always great choices to go along with the burgers, but I wanted to change it up a little. I have found European Brioche Buns at the store the other day and wanted to make a tasty euro sauce to go with it. I know us Euros can be sometimes little funny, like eating French fries with mayo, but this is not the case. This pow wow sauce is just the perfect match for grassfed/grass finished beef. I would guess, you probably have all of the ingredients. Yay Baby! It’s a Dutch Baby! This was a huge success this morning. We are early risers and a big 3T breakfast is a must on our outfit. You might miss lunch sometimes, especially, if your neighbor’s 10 steers decide to visit your pasture and don’t want to leave. “Hey, grass is always greener on the other side of the fence. ;)” The cows always want to prove this saying. We have been trying to cut down on butter, sugar and rich foods and so far so good. This dutch baby recipe called for 1/4 cup of butter and 1/4 cup of sugar. I don’t think so. If I would feed this to my guys, they would load up on sugar and be hungry in a couple of hours. So, here is our version of this recipe. I have served this dutch baby with scrambled eggs and peppers, both from our outfit. Preheat the oven to 425 degrees. At the same time put in your large cast iron skillet to heat up. Add flour, sugar and salt, whisk again for about 30 seconds on high. Carefully pour oil into the hot skillet and put it in the oven for another 30 seconds. Take out the skillet and carefully pour the batter into it. Serve right away. No need for sugar or syrup. It is delicious on its own!